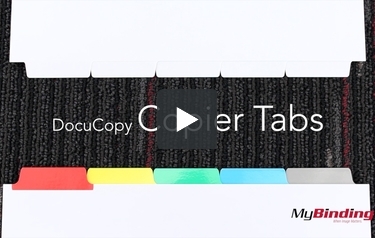 These are DocuCopy Copier Tabs, designed to print on with laser-toner printers! First off, the are organized in different ways: Single Reverse has the last tab on top, and the first tab on the bottom, it repeats this way through the whole stack. Double Reverse starts with the last tab, but is organized that there are two of the same kind of tab next to each other. Straight collated tabs are organized as you would present them in a binder or book with the first tab on the top. Then there is uncollated, which gives you only one position of tab. Which organizational style you use is determined by what your printer requires. They come in plain paper tabs, colored trilar, and clear trilar tabs. You can find two thicknesses of paper, with 90 pounds and 110 pounds, though 90 pounds has the largest variety of tabs. You can purchase them prepunched with a three hole pattern, or you can call for custom punches. These dividers come in variations of 3 tabs to 10 tabs, and as you can see demoed here is the standard 5 tab. The best part, is that you can print on them!